01.) 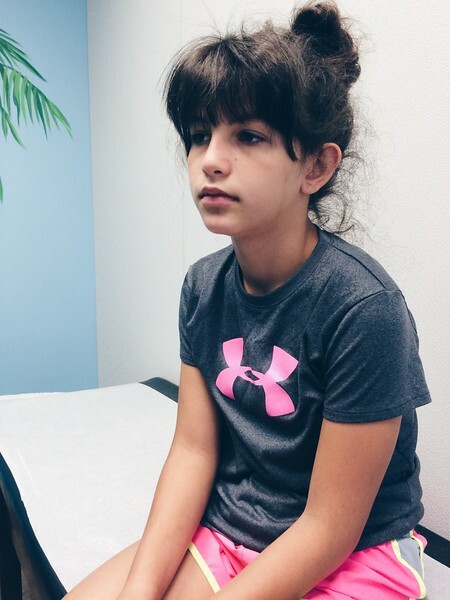 Monday found us at the pediatrician's office with a not so peppy patient. Which we kind of predicted after Schlitterbahn, swimming at my dad's house and swimming with friends on the 4th of July the writing was pretty much on the wall. Or the ear. The doctor prescribed antibiotic drops (CiproDex) which has been helping, along with a heating pad, occasional essential oils (lavender, eucalyptus and/or purification around the outside of her ear) and ibuprofen. Of course we've also had the late night drama of "I'm going deaf!" and "Can I Google busted ear drum?". But she's feeling better, mostly. 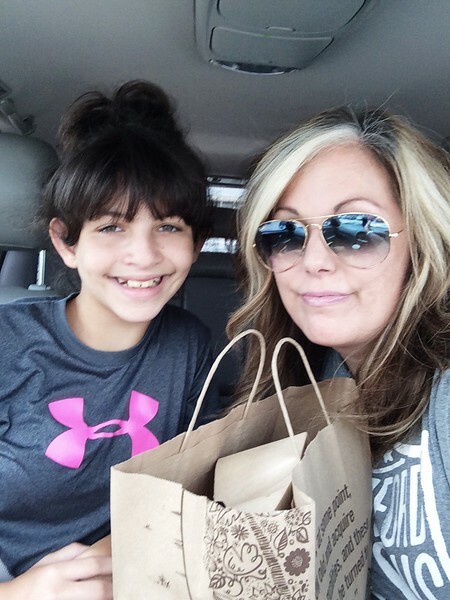 After the doctor visit we self-medicated with a late Chipotle lunch. As you do. 02.) Tuesday involved a follow-up eye doctor visit for Annelise, which she of course forgot her glasses for (left them at Pappo & Gramma's house and they're RVing it) so the whole thing kind of started out DUMB (they said it was fine, they checked her eyes anyway, but I still felt loser-ish) and a grocery store trip. Now I know a grocery store trip is no big deal, but for us it was. For the last sweet forever we had just been picking up a few essentials and eating most of our meals out/take out. I know. So it felt really good to stock up on real food again and so forth. After schlepping it all inside and putting it away and throwing out old stuff from the fridge and cleaning and cutting fruit and veggies and cooking lunch (baked potato with baked bacon for Annelise, roasted brussel sprouts and other yummy veggies for me) and washing dishes I was kind of over it. We ordered pizza for dinner. 03.) In my last post about beauty routines I didn't talk about hair or nails. Sorry! I've struggled with my nails the last few years with them being thin and/or peeling a lot and that's been frustrating. I blame hormonal issues, but what do I know? There have been occasional signs of improvement here and there and right now they are much better. I increased my vitamin B intake a couple of months ago along with changing my multi-vitamin and drinking Ningxia Red regularly for the the last several months (I now use Young Living Super B, their Master Source for Her daily multi-vitamin and Ningxia Red is their Wolfberry and essential oil superhero drink). I also use various oils topically every day so they might also be making a difference. I try to keep my nails short and take breaks from regular polish, maybe that helps too. For the summer I like to use bright colors, usually shades of pink or coral. 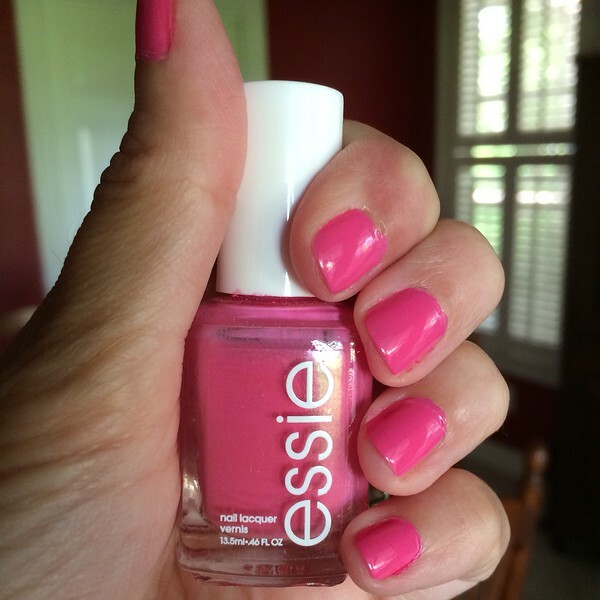 This week I used Off the Shoulder by Essie and really liked it. It's from a couple of years ago so I'm not sure if it's still available, but Essie always has tons of fun colors to choose from. It's dangerous! For the rest of the year I stick with grey or taupe. My current favorite in that color family is Taupeless Beach by OPI. It's the perfect neutral. I usually use Essie (love their tiny brush) or OPI the most often because they last the longest on my nails, although I also like Sally Hanson Complete Manicure polish too. Last summer I tried China Glaze and like a lot of their bright summer-y colors. Last summer I discovered DIY gel nails and still follow that method, loosely (I use Gelous as a base coast and a final top coat over Seche Vite top coat). You can read even more about my nails here and about my favorite drugstore beauty products here (there's a photo of Taupeless Beach by OPI). 04.) I was going to do a whole separate post about my current fitness journey, and maybe I still will, but for now I'll just share a semi-quick update. Back in April I blogged about the workouts Scott and I were doing and...cue drum roll...we finished. We did five weeks of T25 Beta and then four weeks of T25 Gamma (which is an extra 2-disk program that focuses on strength). It was tough. You might not think a 25 minute workout would be tough, but Shaun T packs it in, yo'! The workouts are a mix of cardio and strength and definitely challenging but totally doable since it's only 25 minutes. No excuses! Scott definitely liked that fact since his time is limited and hates committing to a long workout. I highly recommend T25 for all levels of fitness, you can modify or go harder if you need the challenge and...it's only 25 minutes of your day (though one day a week you do double workouts). I feel like I improved my endurance, don't hate burpees so much any more and also gained muscle. To keep my motivation up I treated myself to some new Nike Lunar Tempo shoes in neon volt with a hot pink swoosh and a new pair of Nike Tempo shorts in pink and volt, both on super sale, so yay! I usually wear shorts like these with a tank or t-shirt to workout. 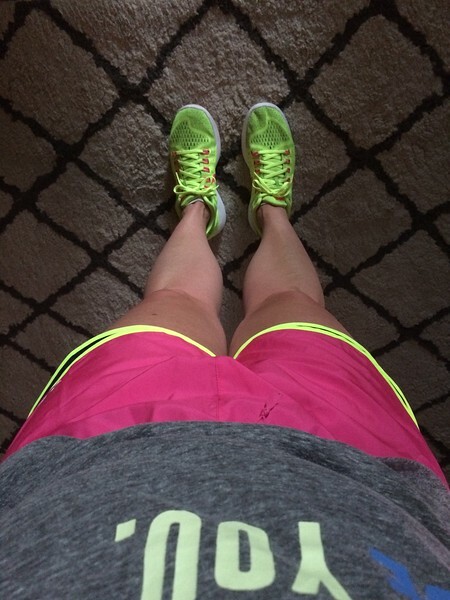 I've tried to wear workout capris, and still do occasionally, but I think Nike Tempo shorts are more my jam. Sidenote: What's your take on women who wear workout capris out and about? Like without enough of their nethers covered? I don't know, even if your hiney looks awesome I don't think it should be flaunted at the grocery store or the mall. Now workout capris with a longer tank or t-shirt or layered with a jacket where at least most of your bottom is covered are okay. Maybe. Leggings are NOT pants, in any context. After T25 I started Insanity, which I've started and stopped numerous times for numerous reasons but maybe this time will be different. Right now, in phase one, the workouts are about 40 minutes, which isn't terrible, but an adjustment after being spoiled by T25. The second month has longer workouts, like about an hour. Yikes! It's cardio based but you also do body weight exercises with push-ups and such. I've made it to week three so far (yay!) but have added a bit of a wrinkle to my routine. 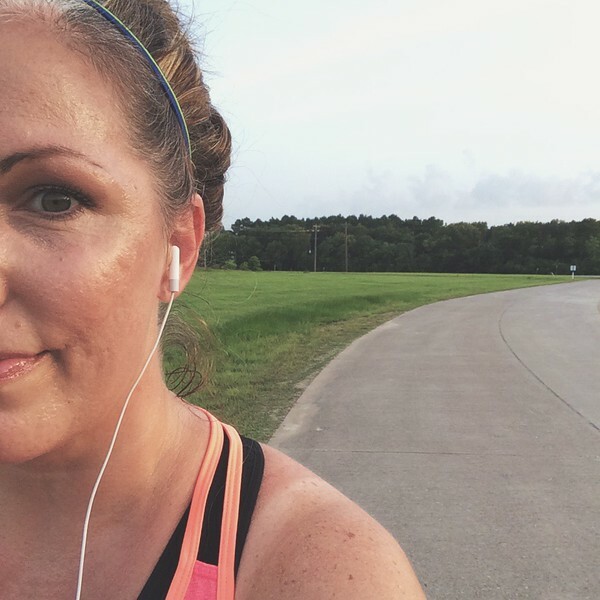 I decided to become a runner again and try for #60milesinjuly. I've done these Instagram challenges before, or at least participated from time to time, and they give me a little accountability. The first few runs were really hard. Even though I'd been working out at home my legs, mainly my quads, had to get adjusted to the repetitive motion again and my feet had to get used to my new Mizunos. It's really proven to me that you shouldn't just do one type of workout, your body needs variety. I'm now at 15 miles for #60milesinjuly and my running groove, such as it is, is finding it's way back. My problem is finding a balance for running while not bailing on Insanity and maybe also fitting in the occasional PiYo or strength workout. I don't know. 05.) Are y'all as excited, or at least as curious, about next week's release of Go Set a Watchmen by Harper Lee as I am? She wrote it before To Kill A Mockingbird and put it aside after publisher's told her to focus more on the character of Scout (Jean Louise) and tell the story from her perspective. I definitely plan to buy it, I mean, how could I not? But I'm a little wary just the same. Sidenote: I adore TKAM and try to read it every few years. Once we had a bloggity book club chat about it and recently shared it with Annelise. Linking up today for Friday Favorites & Five on Friday. Loved your post, Holly! Again, we have much in common: my daughter's name is Alise. I hope your daughter is feeling better! I got a mani yesterday myself and my favorite colors are pinks and reds. I chose Strawberry Margarita. OPI and Essie polishes are my favorite! Congrats on your running! Unfortunately, I am not a runner, but I am a walker. That is, up until about a month ago when I fell down our stairs and now I'm in a boot and on crutches. Not a happy summer for me! Enjoy your weekend! I've started wearing work out clothes in public on Mondays - workout, grocery store & gymnastics all by 10:30, BUT I always have a long tank top to cover my bootie! Ha! I love that nail polish! I'll have to look for it on Amazon. Congratulations on all of your workout accomplishments, that's so impressive and inspiring! I hope your daughter is feeling better! Swimmers ear is so painful from what I can remember from my childhood! Your nails look fantastic! I included summer nails in my Friday Favorites post as well! Great minds think alike! Happy Weekend!